From 2019, JEE Main is conducted by the NTA, the newly formed body by MHRD. NTA is conducting JEE Mains twice a year – once in January and then again in April. This article will tell you all that you need to know about JEE Main 2019. More than 800 engineering colleges in India accept JEE Main score for admission. JEE Main is also the preliminary or qualifying exam to appear in JEE Advanced which is for admission to the Indian Institutes of Technology (IITs) and some other institutes. India’s best data scientists have analyzed the JEE Main papers of the last 22 years on various parameters like the difficulty level, syllabus coverage, ideal time for each question, questions involved with multiple concepts, repetitive nature of concepts, etc. Keeping these parameters in mind, they have generated the JEE Main Predicted Question Paper that is verified by the senior academic experts from across the country. JEE Main Answer Key 2019 with JEE Main 9th April 2019 question paper and solutions. We are continuously updating the JEE Main 9th April 2019 question paper and answer keys. Thus, keep refreshing the page for more memory based questions. As per the revised schedule of JEE Main 2019 (April) Paper 2 will be conducted on April 07th and Paper- 1 will be conducted into multiple sessions between April 08, 9, 10 & 12, 2019. 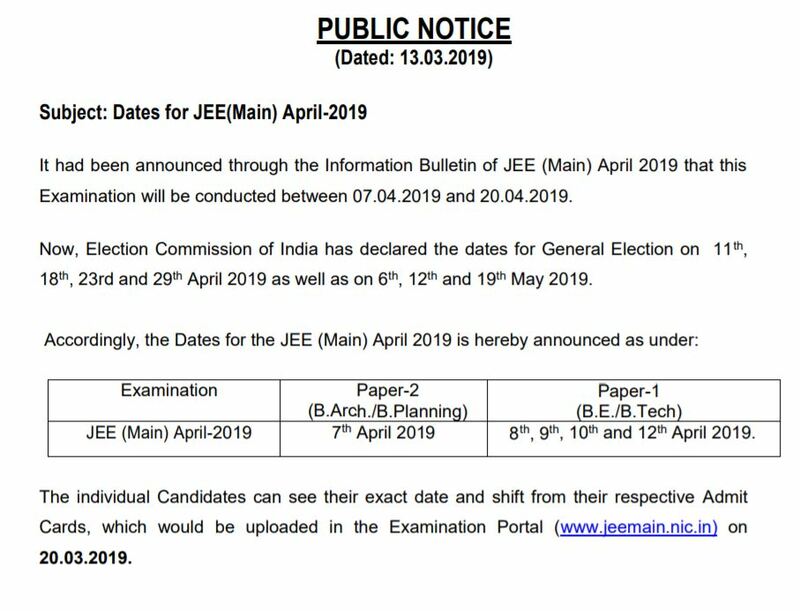 The JEE Main 2019 (April) registration process has been ended. JEE Main 2019 Correction window will be opened for the candidates between March 11 to March 15, 2019. Candidates won’t be able to edit choices of the cities through the same. As per the official notification released by NTA, candidates of EWS category can mention their category in the online application form between March 11 to March 15, 2019. Also, the EWS reservation certificate will not be updated into the online portal. It is mandatory for the candidates to mention the category. As it will be useful for them to access the reservation made for admissions into Central educational institutes. Read this article to check the detailed JEE Main form correction procedure. Note- The transaction of the application fee can be done between February 08, 2019 to March 08, 2019. JEE Admit Card for April session is released today, March 21, 2019, on the official website. Candidates will have to log on to their account with their Application Number and Password or Date of Birth to download Admit Card/Hall Ticket. 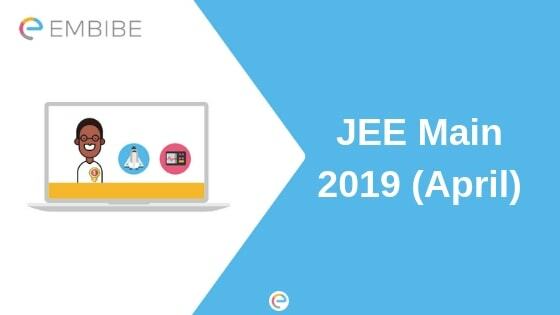 JEE Main 2019 Admit Card will be available on the official website. Following are some useful steps to download the same. Step 1- Go on the official website of JEE Main/ NTA. Step 2- Click on the link to download the JEE Main 2019 Admit Card. Step 3- Enter your Application Number and Password. Step 4- Click on Submit. Step 5- Your admit card will appear on the screen. Save it in a safe folder. Also, take print out of your JEE Main 2019 Admit Card. Note- Candidates must carry their admit card to the exam center without which they won’t be allowed to enter the examination hall. As mentioned above, the online registration for JEE Main 2019 – January was opened from 1st of September 2018 till 30th September 2018. For the April session, the online registration is started from February 08, 2019. The last date to apply for the April session of JEE Main is March 07th, 2019. Paper in which a candidate Is appearing for. Name and address of the school/ college from which the candidate appeared/ passed. Step 1 Go to the official website of JEE Main – jeemain.nic.in. Step 2 Click on “Fill Application Form” and then click on “Apply For JEE Main 2019”. Step 3 Read the instructions and click on “Proceed To Apply Online”. Step 4 Enter your basic details, like, Name, Date of Birth, Gender, Aadhaar details, etc. Step 5 Fill up your personal, academic, contact and exam-related details. Step 6 Upload the scanned copies of the documents (photograph and signatures). Step 7 Make payment of the application fee. Step 8 Submit your application and take a print out of it for future reference. After the online registration, candidates get the opportunity to make corrections in their application form. Candidates have to log in to their account in order to make changes/corrections in the details provided by them. However, they cannot change the exam center. The JEE Mains correction window for the January session is over. The authorities have informed that photographs without name and date have been accepted. So, candidates won’t have to worry about that. Modes of Fee Payment– Credit Card, Debit Card, Net Banking or through e- challan (during the bank hours). As you know that to score better, it is mandatory for you to stay in practice. With the same purpose, our experts have designed some online tests. These tests are based on the JEE Mains session conducted in January 2019. Percentile Score of a Candidate = 100 x (Number of candidates who secured a raw score (or actual score) EQUAL TO OR LESS than the candidate) / (Total number of candidates who appeared in that session). As the JEE Main January session is over and candidates who are going to attempt the April session should start off with the preparation, here we’re including the previous year question paper information for your reference. You can refer to the information given in the article given here to understand the exam trend properly. JEE Main is one of the toughest but most important exams in India. It is mandatory to understand each and every aspect of the exam to be perfectly prepared for it. Here, we’re providing you the exam analysis for 2018 and 2017. It is very important that you read the JEE Mains eligibility criteria properly before you apply for JEE Main 2019. Age Limit: For JEE Mains 2019 exam, the age limit has not been fixed. Qualifying Exam and Subjects: Candidates must have cleared the Class 12 board exam in 2017 or 2018 or are appearing for it in 2019 with 5 subjects, including Physics, Math, and Biology/Chemistry/Technical Vocational Subject. The number of Attempts & Year of Passing the Qualifying Exam: A student can appear for JEE Main thrice in three consecutive years. This means students who passed Class 12 exam in 2017 or 2018 and students who appeared for Class 12 exam in 2019 are eligible to appear for JEE Main 2019 both in January and April. The percentage in Qualifying Exam: For admission to NITs, IIITs, and CFTIs, candidates must score at least 75 percent (65 percent for reserved categories) in their Class 12 board exams or be in the top 20 percentile in their board exams. Note- Each category will have a 5% reservation criteria for the candidates of Physically disabled category. JEE Mains exam pattern will have two sets of the paper. Each paper will be divided as per the course applying. For Paper- 1, there will be 360 maximum marks in the exam and for Paper-2, maximum marks will be 390. There will be 4 marks offered for each right answer. On the other hand, 1 mark will be deducted for each wrong answer. As you can see, each question carries 4 marks. 1 mark will be deducted for every wrong answer. However, there is no penalty for questions not attempted. All the questions will be of MCQ type wherein there will be four options for every question out of which only one answer will be correct. Since JEE Main 2019 question papers will be set up by software designed to pick up questions randomly from a question bank consisting of a large number of questions, you must have a crystal-clear knowledge of all the concepts in the syllabus. There are more than 15,000 concepts in the syllabus of JEE Mains 2019, covering all three subjects. Also, you must solve as many JEE practice questions as possible and improve your problem-solving skills. At the same time, you need to improve your overall test-taking skills as well. 1- Preparation Tips for Chemistry. 2- Six ways to stay motivated for IIT JEE Preparation. 4- How to Prepare The Best Timetable For IIT JEE? JEE Advanced Time- Table. More than 2000 practice centers have been set up and made operational all over India for students to practice and take tests. This will help students get used to the online platform and the test interface. Students will be able to go to the centers on Saturdays and Sundays. You can also solve unlimited JEE practice questions and take JEE mock tests of the same level as the actual exam on Embibe for free. These are available for you 24/7. Step 1- Go to the JEE Main/ NTA official website. Step 2- Click on the link to download the result. Step 4- Enter the security code visible on your screen. Step 5- Your result will appear on the screen. Take print out of your result for further reference. It is clear that JEE Main Exam will be conducted into various sessions. The difficulty level of the exam will also variate. To solve this problem, the candidate’s score will be normalized and converted into percentile based on the NTA Marking Scheme. This was done in JEE Main January as well it will be done in April exams too. The final merit list will be compiled based on the best of two NTA normalized scores secured by a candidate (if the candidate has appeared for the exam both the times). d. Candidates older in age. e. Even after this criterion if the tie is not broken, candidates will be given the same rank. The total number of seats available in various NITs, IIITs, CFTIs, and other participating institutes. The total number of candidates appearing in the exam. It is to be noted that clearing the cut off marks doesn’t mean you will get a seat for sure. In order to guarantee a seat, you must score as high as possible. The counselling process will start in the month of July 2019. The Joint Seat Allocation Authority (JoSAA) conducts the counselling. The allocation of seats is done on the basis of the JEE merit list/rank list, preference of the candidates, and the availability of seats. It is to be noted that for students who appear in JEE Main both in January and April, the best of the two scores will be considered for admission. Q1- What is JEE Mains? Ans- JEE Main is the first stage of a two-stage engineering entrance exam for students seeking admissions on the graduation level. JEE Exam is being organized by IIMs each year for admissions into top engineering colleges in India like NITs, IITs etc. Q2- What is the eligibility for JEE Main 2019? Ans- Candidates must have cleared the Class 12 board exam in 2017 or 2018 or are appearing for it in 2019 with 5 subjects, including Physics, Math, and Biology/Chemistry/Technical Vocational Subject. Q3- What is the difference between JEE Main Paper 1 and Paper 2? Ans- JEE Main Paper 1 is for those students who are looking for admissions into B.tech courses among top colleges in India. It consists subject like Physics, Chemistry, and Mathematics as major subjects in the exam pattern. JEE Main Paper 2 is for the students looking for admissions into B.Arch and B.Planning courses. Q4- What is the eligibility for IIT? Ans- Candidates must have at least 75% in their 10+2th exam and a top cut-off score which can be varied as per various IITs. If SC/ST or Physically Handicapped, 10% of the relaxation in 10+2 score will be provided. Q5- Is there any age limit for JEE? Ans- As per the official notification, there is no clause of any kind of age limit in JEE Main 2019 Notification. Students appeared or appearing their 12th board exam in 2017,2018, and 2019 respectively can apply for this exam. Q6- Can we get NIT through JEE Mains? Ans- Yes, to be eligible for NIT counselling, it is not mandatory to score enough to be eligible for JEE advanced. So you can get NIT admission through JEE Main by clearing JEE Main exam with required rank and clearing counselling process with expected performance. Q7- Is JEE necessary for engineering? Ans- Nope, there are various other exams to provide engineering admissions into India. JEE is required only if you want to get admission into colleges like NITs or IITs. However, various other colleges also accept the JEE score to provide admissions. Q8- What is the minimum age for IIT JEE? Ans- As per the age clause, the student must be at least 17 years old to be eligible for the JEE Main exam. Q9- How many subjects are there in JEE Main for engineers? Ans- JEE Main will have three subjects into the exam pattern for engineering students. The paper will be known as Paper- I and will consist of Physics, Mathematics, and Chemistry. Q 10- What is the difference between IIT and JEE? Ans- JEE is an exam being conducted by NTA since 2019 for admissions into top engineering courses in India. While IIT is a group of colleges built by the government and which are being considered as top Indian colleges for engineering. Q 11- Which is the largest IIT? Ans- IIT, Kharagpur is being known as the largest IIT campus in India with 2100 acres. Q 12- How can I study for JEE? Ans- To study for JEE, it is advised for students to attempt mock tests, attempt question papers, Prepare the subjects chapter-wise and work on the weaker points first. Q 13- Which is the number 1 IIT in India? Ans- IIT Kharagpur is being considered as a topmost IIT College for engineering admissions. You must take your JEE (Main) preparation seriously even though the exam will be conducted twice a year. You should give your best shot in the first attempt itself so that you don’t have to appear in the exam the second time or at least worry about your performance. According to the JEE Notification, JEE Main exam will be based on the CBSE syllabus of Class 11 and 12. Students can access JEE study materials for free on Embibe. There are also innumerable free JEE practice questions available on Embibe. Embibe also provides free JEE mock tests which are of the same level as the actual exam. It has been found that students score the same marks in the actual JEE Main exam as their score in the Embibe tests. Also, with Embibe’s Advanced Test Analysis and Personalised Guidance, Embibe guarantees score improvement. Is the exam pattern and syllabus same as before? Hey Irshad, as per the notification, you have to upload only your photograph, signature and your parent’s/guardian’s signature. Thumb impression is not needed. Hey Gauri, as far as I know, there is no such provision. Can I take the exam in Gujrati anywhere in India? Hey Sutirtha, no. You can take the paper in Gujarati only in Gujarat, Daman & Diu and Dadra and Nagar Haveli. The last date for changing exam centre for JEE Main 2018 was January 22. I’m sorry to say that you missed the date. Your last option is to contact the CBSE officials. All the best. Please contact the CBSE officials.